A roll of yellow tracing paper. Tracing paper is paper made to have low opacity, allowing light to pass through. It was originally developed for architects and design engineers to create drawings which could be copied precisely using the diazo copy process; it then found many other uses. The original use for drawing and tracing was largely superseded by technologies which do not require diazo copying or manual copying (by tracing) of drawings. The transparency of the paper is achieved by careful selection of the raw materials and the process used to create transparency. Cellulose fibre forms the basis of the paper, usually from wood species but also from cotton fibre. Often, paper contains other filler materials to enhance opacity and print quality. For tracing or translucent paper, it is necessary to remove any material which obstructs the transmission of light. When tracing paper is placed onto a picture, the picture is easily visible through the paper. Thus, it becomes easy to find edges in the picture and trace the image onto the tracing paper. Pure cellulose fiber is translucent, and it is the air trapped between fibers that makes paper opaque and look white. If the fibers are refined and beaten until all the air is taken out, then the resulting sheet will be translucent. 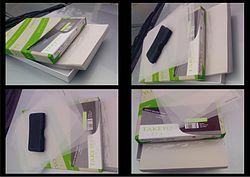 Translucent papers are dense and contain up to 10% moisture at 50% humidity. Tracing paper is usually made from sulfite pulp by reducing the fibres to a state of fine subdivision and hydrolysing them by very prolonged beating in water. Through mechanical ‘refining’ of the cellulose fibre to create a fibre which is highly fibrillated and gelatinous, so that in forming the sheet of paper, virtually all air is excluded from the internal structure of the paper. This method produces a very translucent and even looking paper over a range of grammages from 42 to over 280 gsm. By making a ‘normal’ sheet of paper and then filling the spaces between the fibres with a material that has the same refractive index as the cellulose. This was a common process adopted in the USA. The product was frequently called Vellum, although this terminology can refer to a wider range of special papers. Due to the relatively high cost, this method of manufacture has largely disappeared. As with 2, by making a normal sheet of paper, which is followed by immersing uncut and unloaded paper of good quality in sulfuric acid for a few seconds. The acid converts some of the cellulose into amyloid form having a gelatinous and impermeable character. 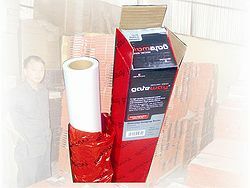 When the treated paper is thoroughly washed and dried, the resultant product is much stronger than the original paper. Tracing paper is resistant to oil, grease and to a large extent impervious to water and gas. The sizing in production will determine whether it is for laser printer or inkjet/offset printing. Tracing paper may be uncoated or coated. [further explanation needed] Natural tracing paper for laser printing is usually uncoated. The HS code for tracing paper is 4806.30. Tracing paper can be recycled and also can be made from up to 30% recycled fibre. ^ "Paper and paperboard; articles of paper pulp, of paper or of paperboard". wcoomd.org. ^ "Frequently Asked Questions | Arjoqiggins Creative Papers". arjowiggins-tracingpapers.com. ^ "ISO 536:2012 – Paper and board -- Determination of grammage". iso.org. ^ "ISO 287:2009 – Paper and board -- Determination of moisture content of a lot -- Oven-drying method". iso.org. ^ "ISO 8791-2:2013 – Paper and board -- Determination of roughness/smoothness (air leak methods) -- Part 2: Bendtsen method". iso.org. ^ "ISO 2469:2014 – Paper, board and pulps -- Measurement of diffuse radiance factor (diffuse reflectance factor)". iso.org. ^ "ISO 1974:2012 – Paper -- Determination of tearing resistance -- Elmendorf method". iso.org. ^ a b "ISO 6588-1:2012 – Paper, board and pulps -- Determination of pH of aqueous extracts -- Part 1: Cold extraction". iso.org. 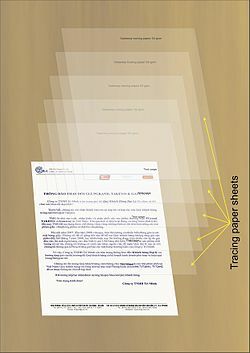 Wikimedia Commons has media related to Tracing paper.